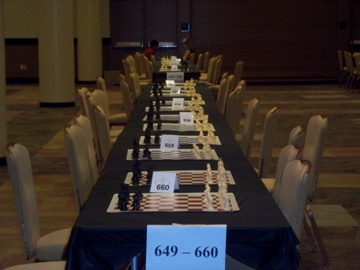 04.19.08 After two days and five rounds of extremely tough, national-level chess, the John Bapst team is holding their own against very talented competition. Zach Smith leads his team with 4.0 points; Fritz Eyerer, Aaron Spencer, Kurt Eyerer and Omar Khan have 3.0 points; Maggie Bryan, Anna Bryan and Daniel Honeycutt have 2.0 points. Here's the latest from Day 2 including links to results and selected games. 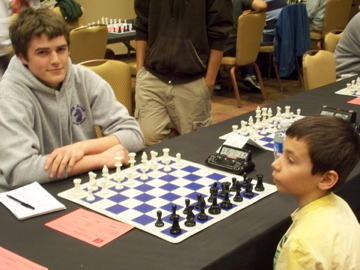 Fritz Eyerer plays Alex Velikanov, a 4th grader from Wisconsin rated 2028, in the forth round. 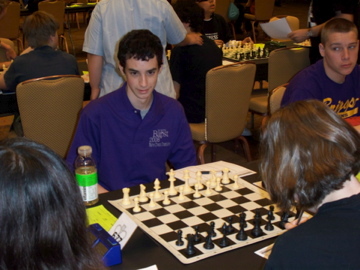 Although better at some points in the game, Eyerer was eventually defeated by this talented junior. Maggie Bryan about to begin her game vs. Brian Turley of Kansas, (1-0). Daniel Honeycutt prepares for Trish Winston of Arizona. Honeycutt won this game to score 2.0 points in his first four rounds. 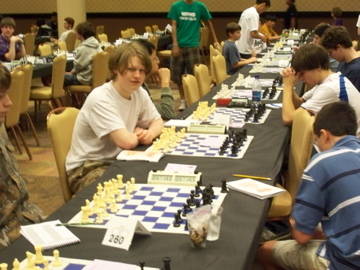 Aaron Spencer waits for his round four opponent. 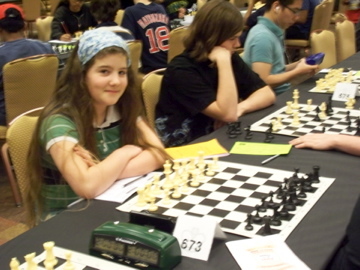 Sister of Bapst player Margaret Bryan, Anna Bryan is competing in her first National High School Championship. 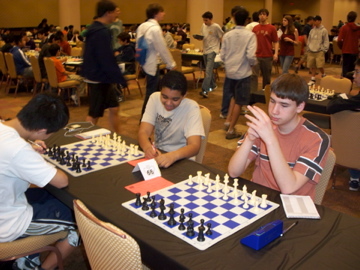 Zach Smith scored a point for his fourth round win over Georgia player Rohan Bagga then went on to win his fifth round game as well. 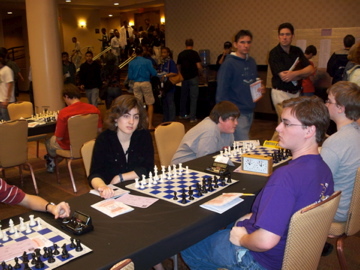 The game Anna Bryan (right) vs. D. Kumar of Maryland was one of the last of the fifth round. I am very proud of your excellent playing! All the best!